I’ve been back from my holiday in New York for a week so it’s time I got on with blogging about it. I had an absolutely amazing time, despite the evil heat stopping me from doing everything I wanted to, so I’ve got plenty to say. I know blogging about holidays isn’t supposed to be the done thing, but I love reading other people’s posts about their travels so I don’t care! One of the reasons I chose to return to New York when I got the chance for a holiday was that it has loads of brilliant places to eat that cater for my gluten free diet. I had a list of places that I went to last time, and spent a couple of hours researching new places online so that I ended up with a good variety of options. By the time I was getting ready to come home there were still places I hadn’t visited, I think that means I need to go again! Here are some of the wonderful places I visited. Food: Pizza made with local, seasonal, healthy ingredients including the option of a gluten free base. 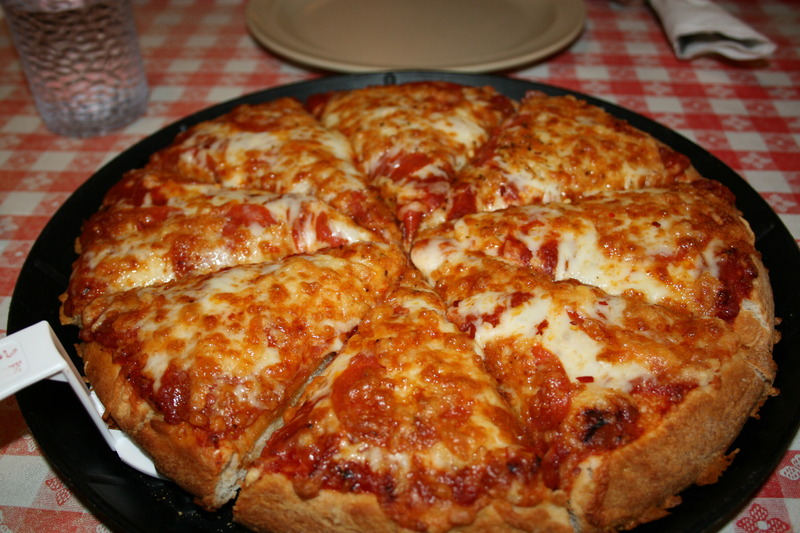 What I had: I chose the basic cheese pizza, I was a little overwhelmed by having choice so played it very safe. The pizza was very tasty, the base was very thin and crispy with an unusual but nice flavour. I had their non-alcoholic cucumber mojito which was also lovely. Chicken Tortilla Pie from Rosa Mexicano. Food: They have specific gluten free lunch and dinner menus offering a range of Mexican dishes. What I had: I visited twice, I had their chicken enchiladas on one visit and chicken tortilla pie on the other. Both dishes came with house rice and their refried black beans. Both meals were delicious and I enjoyed the refried beans but I wasn’t very keen on the rice which was a little more al dente than I like it. Food: They offer a range of Mexican food using corn tortillas, their website has quite a bit of information about gluten free options though the menus don’t show this and the waitress I had needed to go and ask what was suitable for me. What I had: Quesadillas, I chose to stick with the basic option and it was delicious. Like Rosa Mexicano this dish came with refried black beans and house rice, and again I enjoyed the beans but not the rice. 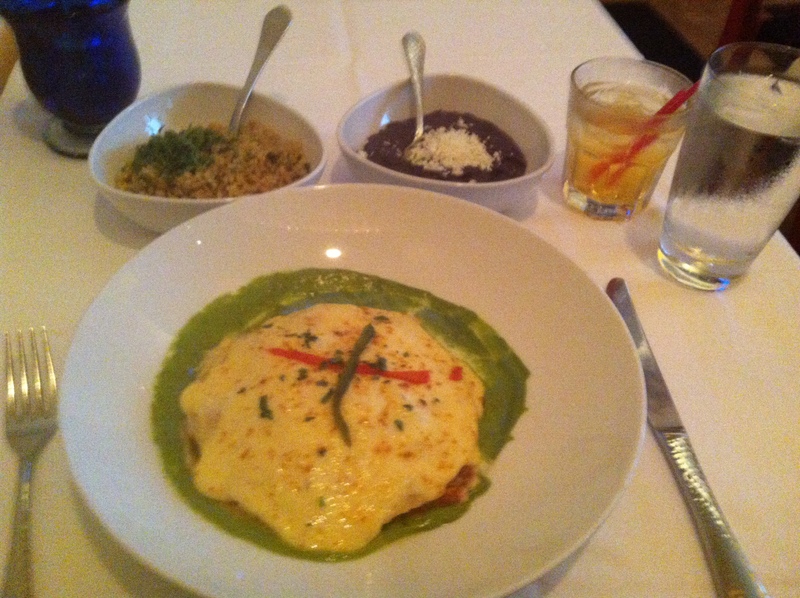 The food was nice, but the overall experience wasn’t as good as I had at Rosa Mexicano. 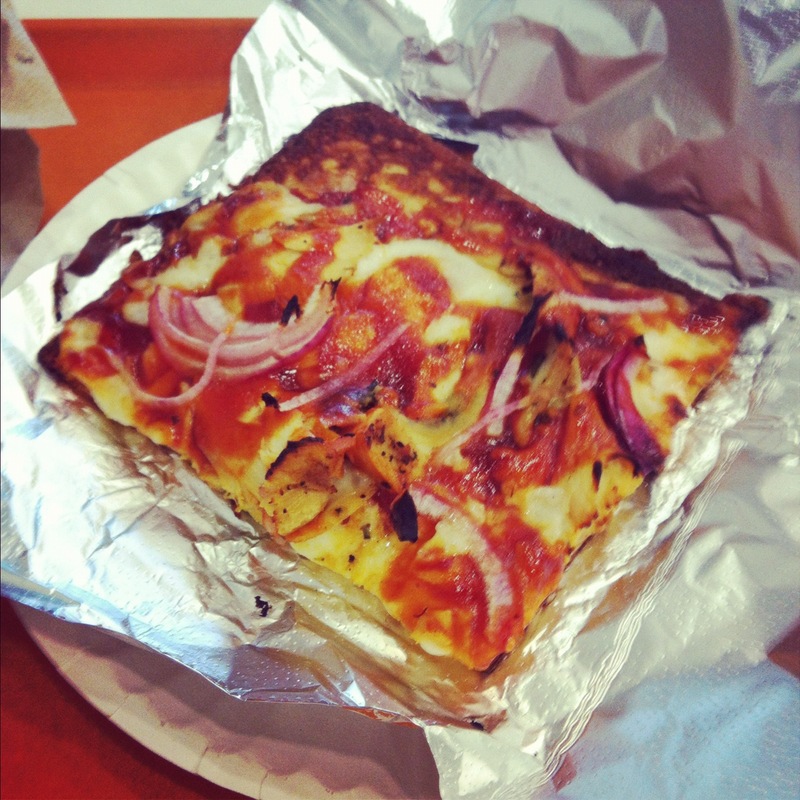 Food: They offer gluten free pizza by the slice, gluten free pastas and gluten free desserts including cheesecake. What I had: I was completely blown away by the range of pizzas they had on offer, I ended up choosing a slice of barbecue pizza and then strawberry cheesecake to follow. Both were absolutely delicious, I was tempted to go and spend a bit of time in the nearby Madison Square Park before going back for more! It is worth mentioning that the staff are all a little brusque but the food’s well worth it. Food: Macaroni & Cheese every way you can think of it, they offer a choice of 12 different varieties all with the option of gluten free pasta and breadcrumbs. What I had: I stuck to a fairly classic choice and had the 4 cheese version. It was absolutely delicious, if I’d had the opportunity I’d definitely have gone back so I could try another one or two. 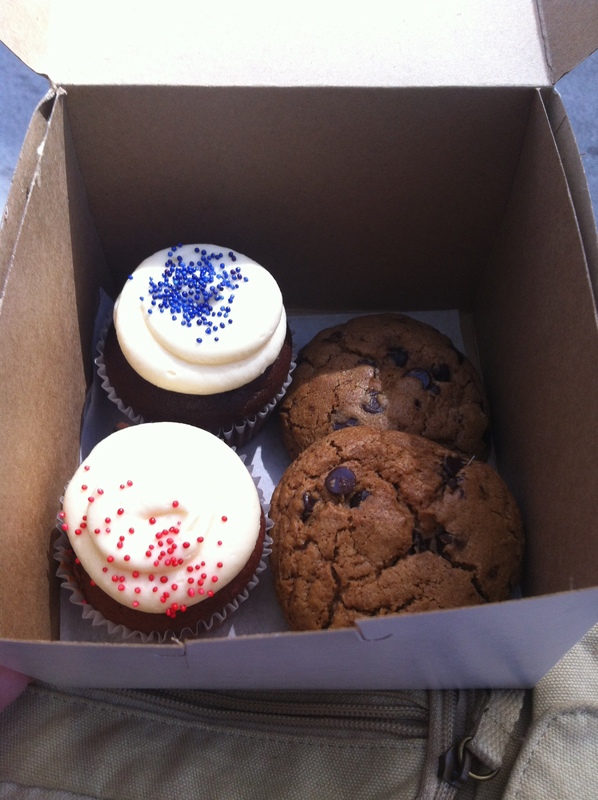 Cupcakes and cookies from Tu Lu’s Gluten-Free Bakery. Website: Their own site is down at the moment, but their Facebook page is here. Food: All sorts of baked goods – cupcakes, cookies, brownies and more. What I had: I tried their red velvet cupcake, chocolate cupcake with vanilla cream cheese frosting and chocolate chip cookies. They were all lovely, and it was such a treat to be able to walk into a cake shop and come out with great things to eat. I also revisited Blooms Deli and went to the Hampton Chutney Co. and had tasty lunches at them both. It was so nice to be able to go to so many restaurants and eat food that I knew was definitely safe, I can only dream of the day when cities in the UK catch up!